Digital keyboards on pianos are the sound devices that, when pressed, make individual notes. They do this by completing an electrical connection, which modifies a frequency to emit a tone. Although very sturdy in construction, some of the most common complaints with digital pianos are a lack of sound, too loud or too weak a sound or a stuck key. 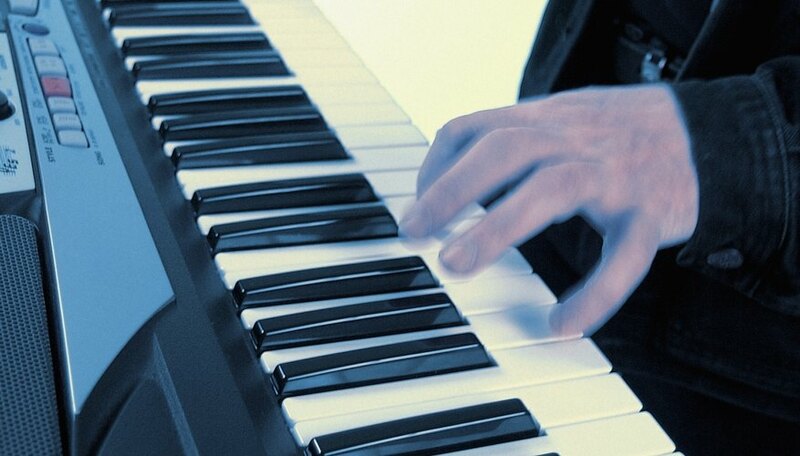 Digital pianos vary in design and model from one manufacturer to another, although the key contact pads are very similar and basic to the models that use them. Anyone who owns a digital piano can repair the contact keys on his digital piano by using a few simple tools, products and steps. Use a felt pen to mark the position of the nonresponsive key on the underside of the piano frame. Unplug the piano's main supply cord. Turn the piano on its back on a flat, clean surface. Place a block of wood under the joystick portion if it protrudes past the case. Use a screwdriver to remove the bottom case screws and set the case aside -- remove only the screws that allow the bottom case to slide out. Locate the mounting screws that hold the main circuit board in place. Use a screwdriver to remove all the screws and place them aside in order. Use wire cutters to cut the cable tie straps that hold connectors or cable ribbon to the board. Remove the cable connectors and ribbons and place a piece of masking tape on the ribbon and connector ends and their receptacles. Mark them numerically so you can match them up. Put the circuit board aside. Use a screwdriver to remove the screws on the key scan circuit board. Tape the connector ends and their receptacles, using letters for matching purposes. Remove the keyboard assembly brass screws with a screwdriver. The screws will be located on the ends and middle of the assembly chassis. Unplug the small sensor cable located at the bass end of the assembly, noting in which direction it connects to the prong. Use a screwdriver to remove any wire bundle screws that also serve as mounting screws. Pull the wire loom gently away from the keyboard assembly. Lift the keyboard assembly out of the main frame. Make sure all wire connectors and ribbons are detached. Look at the plastic film strip that holds the ends of the black and white keys. Gently pull up one end of the strip and pry it away from the damaged key. Use a pair of needle-nose pliers to remove the two key springs on each side of the damaged key, and then remove the damaged key spring. Keep the springs in the exact order in which they came off. Remove the individual keys by sliding them forward, then lifting up on their rear ends. You will see a rubber contact strip attached to a circuit board with small rubber pins or nibs. Pull out the rubber strip that is located over the damaged key. Use alcohol and cotton swabs to clean the circuit traces on the board that sat under the strip. Vacuum away any debris, hair or dust on the circuit board. Use alcohol and swabs to clean the rubber contact strip on both sides, wiping inside the two small concave holes and on top of the rubber protrusions. Reinsert the rubber strip back onto the circuit board by pushing the small legs (nibs) back into place. Set the keys back into position and attach the key springs with the needle-nose pliers, matching the correct springs to the keys. Glue down the plastic film strip that holds the rear part of the keys in place, using some white glue. Place the keyboard assembly back into the chassis and reinsert the screws by hand. Tighten the screws with a screwdriver. Reconnect the small flexible cable at the base end. Place the key scan circuit board back into position and insert the screws; tighten the screws with a screwdriver. Use the lettering on your masking tape to reconnect the wires and ribbons on the key scan circuit board. Set the main circuit board back into position and insert the mounting screws by hand; tighten the screws with a screwdriver. Use the numbered masking tape pieces to match the wire and ribbon connectors to their receptacles. Use tie straps to refasten any loom that you cut loose during disassembly. Place the bottom cover onto the piano frame and insert the screws. Tighten the screws with a screwdriver. Test the instrument. If the tone quality seems off, this will be normal until the contacts completely dry after a day or two.